In supramolecular chemistry, host–guest chemistry describes complexes that are composed of two or more molecules or ions that are held together in unique structural relationships by forces other than those of full covalent bonds. Host–guest chemistry encompasses the idea of molecular recognition and interactions through non-covalent bonding. Non-covalent bonding is critical in maintaining the 3D structure of large molecules, such as proteins and is involved in many biological processes in which large molecules bind specifically but transiently to one another. There are four commonly mentioned types of non-covalent interactions: hydrogen bonds, ionic bonds, van der Waals forces, and hydrophobic interactions. Host–guest chemistry is a branch of supramolecular chemistry in which a host molecule forms a chemical compound with a guest molecule or ion. The two components of the compound are held together by non-covalent forces, most commonly by hydrogen-bonding. Binding between host and guest is usually highly specific to the two moieties concerned. The formation of these complexes is central to the subject of molecular recognition. H ="host", G ="guest", HG ="host–guest complex"
The "host" component can be considered the larger molecule, and it encompasses the smaller, "guest", molecule. In biological systems, the analogous terms of host and guest are commonly referred to as enzyme and substrate respectively. In order to design synthetic systems that perform specific functions and tasks, it is very important to understand the thermodynamics of binding between host and guest. Chemists are focusing on the energy exchange of different binding interactions and trying to develop scientific experiments to quantify the fundamental origins of these non-covalent interactions by utilizing various techniques such as NMR spectroscopy, UV/visible spectroscopy and isothermal titration calorimetry,. Quantitative analysis of binding constant values provides useful thermodynamic information. The thermodynamic benefits of host–guest chemistry are derived from the idea that there is a lower overall Gibbs free energy due to the interaction between host and guest molecules. Chemists are exhaustively trying to measure the energy and thermodynamic properties of these non-covalent interactions found throughout supramolecular chemistry; and by doing so hope to gain further insight into the combinatorial outcome of these many, small, non-covalent forces that are used to generate an overall effect on the supramolecular structure. In practice the equilibrium constant is usually defined in terms of concentrations. is unchanged. Put another way, when the equilibrium constant is calculated as a quotient of concentrations it is implicitly assumed that the activity coefficient of each chemical species has a value of 1, which is effectively a definition of the thermodynamic standard states. represent the total concentrations, of host and guest, can be reduced to a single quadratic equation in, say, [G] and so can be solved analytically for any given value of K. The concentrations [H] and [HG] can then derived. and this can be minimized with respect to the stability constant value, K, and a parameter such the chemical shift of the species HG (nmr data) or its molar absorbency (uv/vis data). The minimization can be performed in a spreadsheet application such as EXCEL by using the in-built SOLVER utility. should show a random distribution; otherwise the formation of a second species should be considered, using the methods of the following section. c is a concentration / mol dm−3) of that species. This expression has the same mathematical form as Beer's law. Chemical shift values may be obtained for more than one nucleus in an analogous way that absorbance may be measured at more than one wavelength. Typical isotopes that may be used in this context are 1H,13C and 31P. It is usual to use a deuterated solvent when measuring 1H chemical shift values. It is assumed that the absorbance of each species is proportional to the concentration of that species, according to the Beer-Lambert law. is the molar absorbance (also known as the extinction coefficient) of the ith chemical species at the wavelength λ, ci is its concentration. When the concentrations have been calculated as above and absorbance has been measured for samples with various concentrations of host and guest, the Beer-Lambert law provides a set of equations, at a given wavelength, that which can be solved by a linear least-squares process for the unknown extinction coefficient values at that wavelength. The treatment of this type of data is similar to the treatment of absorbance data. In fact the equation defining the relation between fluorescent intensity and species' concentrations is very similar. is the fluorescent intensity of the ith species at unit concentration. is calculated by solving the equations of mass-balance with given values of the equilibrium constants. If the equilibrium constant values are known, the standard enthalpy change may be calculated by a linear least-squares process, otherwise a non-linear method of data-fitting must be used. Isothermal titration calorimetry is commonly used to determine the values of both an equilibrium constant and the corresponding standard reaction enthalpy. The manufactures of ITC instruments supply some software with which these quantities may be obtained from experimental data values. are obtained by solving the equations of mass balance with known or estimated values for the stability constants.
. The relationship between a species' concentration and the measured quantity is specific for the measurement technique, as indicated in each section above. Using this relationship, the set of parameters, the stability constant values and values of properties such as molar absorptivity or specified chemical shifts, may be refined by a non-linear least-squares refinement process. For a more detailed exposition of the theory see Determination of equilibrium constants. Some dedicated computer programs are listed at Implementations. Consider, first, the system where a solution contains certain amounts of a host, H, and a guest, G, in equilibrium with the single complex HG. Now suppose that a small amount of guest is added to a mixture of host and guest at equilibrium. A new equilibrium will then be established and a quantity of heat, Q will be evolved. When this quantity has been measured and corrected for instrumental factors it is related to the change in the amount of the complex HG that is present in solution. is the change in the number of moles of the species HG in solution. can be calculated by solving the equations of mass-balance before and after the addition (see #Simple host–guest complexation, above). Then, the value of ΔH⊖ can be obtained using the method of linear least-squares fitting with a series of experimental values of Q.
. When the data are obtained using an Isothermal titration calorimetry the software required for the calculations is supplied by instrument manufacturer. Note: use of the van 't Hoff equation to calculate the standard enthalpy change is deprecated because the value obtained using this method is likely to be subject to excessive error. In general, when m complexes are formed the heat developed at the kth "titration" point is the sum of the contributions resulting from a change in concentration of a reaction product. There are 2m parameter to be determined, a standard enthalpy change and an equilibrium constant for the formation of each reaction product. ITC instrument manufacturers supply a few specific software products with which multiple parameter values may be calculated. Computer programs for the general case such as HypΔH. Affinimeter ITC are also available. at the given temperature, T.
Nuclear magnetic resonance (NMR) is one of the most powerful spectroscopic techniques in analytical chemistry. It is an important tool for the studies of host–guest complexes, for elucidating the structures of the various complexes existing in the form of aggregates, ion pair or encapsulated systems. As the name suggests, NMR identifies the different nuclei in the molecules (most commonly, proton), by measuring their chemical shift. The binding activity of two molecules causes a considerable change in their electronic environments. This leads to a shift in the signals in the NMR spectrum, and this basic principle is made use of to study the phenomena of host–guest chemistry. The driving forces for host–guest binding are the various secondary interactions between molecules, such as hydrogen bonding and pi–pi interaction. Thus, NMR also serves as an important technique to establish the presence of these interactions in a host–guest complex. Dendrimers used for drug delivery applications (only end groups shown for simplicity) and the common drugs. The nature of the binding between the drug and the dendrimer is important for efficient release of drugs in the body. Previous NMR studies have given useful information about the binding of different guest to hosts. Fox et al. calculated the hydrogen-bond interactions between pyridine molecules and poly(amido amine (PAMAM) dendrimer; on the basis of the chemical shift of the amine and the amide groups. In a similar study, Xu et al. titrated carboxylate based G4 PAMAM dendrimer (the host) with various amine based drugs (the guests) and monitored the chemical shifts of the dendrimer. In conjunction with the 2D-NOESY NMR techniques, they were able to precisely locate the position of the drugs on the dendrimers and the effect of functionality on the binding affinity of the drugs. They found conclusive evidence to show that the cationic drug molecules attach on the surface of anionic dendrimers by electrostatic interactions, whereas an anionic drug localizes both in the core and the surface of the dendrimers, and that the strength of these interactions are dependent on the pKa values of the molecules. In a different study, Sun et al. studied the host–guest chemistry of ruthenium trisbipyridyl-viologen molecules with cucurbituril. Whilst monitoring the change in the chemical shifts of the pyridine protons on viologen, they found that the binding modes for the 1:1 complexes are completely different for different cucurbituril molecules. In cucurbituril, only four aromatic protons per single bipyridyl ligand take part in the binding process, whilst all the aromatic protons of the ligand form a part of the complex when cucurbituril is used. However, an important factor that has to be kept in mind while analyzing binding between the host and the guest is the time taken for data acquisition compared to the time for the binding event. In a lot of cases, the binding events are much faster than the time-scale of data acquisition, in which case the output is an averaged signal for the individual molecules and the complex. The NMR timescale is of the order of milliseconds, which in certain cases when the binding reaction is fast, limits the accuracy of the technique. Ultraviolet–visible spectroscopy is one of the oldest and quickest methods of studying the binding activity of various molecules. The absorption of UV-light takes place at a time-scale of picoseconds, hence the individual signals from the species can be observed. At the same time, the intensity of absorption directly correlates with the concentration of the species, which enables easy calculation of the association constant. 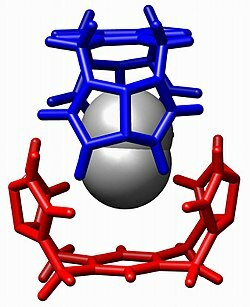 Most commonly, either the host or the guest is transparent to UV-light, whilst the other molecule is UV-sensitive. The change in the concentration of the UV-sensitive molecules is thus monitored and fitted onto a straight line using the Benesi–Hildebrand method, from which the association constant can be directly calculated. (host) with various guests imidazoles and amino acid methyl esters, along with the other parameters. They titrated a fixed concentration of the zinc complex with varying amounts of the imidazoles and methyl esters whilst monitoring the changes in the absorbance of the pi-to-pi* transition band at 368 nm. The data fit a model in which the ratio of guest-to-host is 2 in the complex. They further carried these experiments at various temperatures which enabled them to calculate the various thermodynamic parameters using the van 't Hoff equation. indicated that the process was enthalpy driven with a value of 8–12 kcal/mol for each drug. Raman spectroscopy is a spectroscopic technique used in the study of molecules which exhibit a Raman scattering effect when monochromatic light is incident on it. The basic requirement to get a Raman signal is that the incident light brings about an electronic transition in the chemical species from its ground state to a virtual energy state, which will emit a photon on returning to the ground state. The difference in energy between the absorbed and the emitted photon is unique for each chemical species depending on its electronic environment. Hence, the technique serves as an important tool for study of various binding events, as binding between molecules almost always results in a change in their electronic environment. However, what makes Raman spectroscopy a unique technique is that only transitions which are accompanied by a change in the polarization of the molecule are Raman active. The structural information derived from Raman spectra gives very specific information about the electronic configuration of the complex as compared to the individual host and guest molecules. Schematic representation of Resonance Raman scattering. Lambda is the incident wavelength of the laser. of −5.7±0.6 kcal/mol. The study is now providing a basis for similar studies involving charge-transfer complexes in solutions. Cooperativity is defined to be when a ligand binds to a receptor with more than one binding site, the ligand causes a decrease or increase in affinity for incoming ligands. If there is an increase in binding of the subsequent ligands, it is considered positive cooperativity. If a decrease of binding is observed, then it is negative cooperativity. Examples of positive and negative cooperativity are hemoglobin and aspartate receptor, respectively. is less, then it is negatively cooperative. Host–guest chemistry is not limited to receptor-lingand interactions. It is also demonstrated in ion-pairing systems. In recent years, such interactions are studied in an aqueous media utilizing synthetic organometallic hosts and organic guest molecules. For example, a poly-cationic receptor containing copper (the host) is coordinated with molecules such as tetracarboxylates, tricarballate, aspartate, and acetate (the guests). This study illustrates that entropy rather than enthalpy determines the binding energy of the system leading to negative cooperativity. The large change in entropy originates from the displacement of solvent molecules surrounding the ligand and the receptor. When multiple acetates bind to the receptor, it releases more water molecules to the environment than a tetracarboxylate. This led to a decrease in free energy implying that the system is cooperating negatively. In a similar study, utilizing guanidinium and Cu(II) and polycarboxylate guests, it is demonstrated that positive cooperatively is largely determined by enthalpy. In addition to thermodynamic studies, host–guest chemistry also has biological applications. At low temperatures and high pressures, bismuth has been found to exhibit a host–guest structure. This surprisingly leads to strong coupling superconductivity. Dendrimers in drug-delivery systems is an example of various host–guest interactions. The interaction between host and guest, the dendrimer and the drug, respectively, can either be hydrophobic or covalent. Hydrophobic interaction between host and guest is considered "encapsulated," while covalent interactions are considered to be conjugated. The use of dendrimers in medicine has shown to improve drug delivery by increasing the solubility and bioavailability of the drug. In conjunction, dendrimers can increase both cellular uptake and targeting ability, and decrease drug resistance. The solubility of various NSAIDs increases when it is encapsulated in PAMAM dendrimers. This study shows the enhancement of NSAID solubility is due to the electrostatic interactions between the surface amine groups in PAMAM and the carboxyl groups found in NSAIDs. Contributing to the increase in solubility are the hydrophobic interactions between the aromatic groups in the drugs and the interior cavities of the dendrimer. When a drug is encapsulated within a dendrimer, its physical and physiological properties remains unaltered, including non-specificity and toxicity. However, when the dendrimer and the drug are covalently linked together, it can be used for specific tissue targeting and controlled release rates. Covalent conjugation of multiple drugs on dendrimer surfaces can pose a problem of insolubility. This principle is also being studied for cancer treatment application. Several groups have encapsulated anti-cancer medications such as: Camptothecin, Methotrexate, and Doxorubicin. Results from these research has shown that dendrimers have increased aqueous solubility, slowed release rate, and possibly control cytotoxicity of the drugs. Cisplatin has been conjugated to PAMAM dendrimers that resulted in the same pharmacological results as listed above, but the conjugation also helped in accumulating cisplatin in solid tumors in intravenous administration. Traditionally, chemical sensing has been approached with a system that contains a covalently bound indicator to a receptor though a linker. Once the analyte binds, the indicator changes color or fluoresces. This technique is called the indicator-spacer-receptor approach (ISR). In contrast to ISR, Indicator-Displacement Assay (IDA) utilizes a non-covalent interaction between a receptor (the host), indicator, and an analyte (the guest). Similar to ISR, IDA also utilizes colorimetric (C-IDA) and fluorescence (F-IDA) indicators. In an IDA assay, a receptor is incubated with the indicator. When the analyte is added to the mixture, the indicator is released to the environment. Once the indicator is released it either changes color (C-IDA) or fluoresces (F-IDA). IDA offers several advantages versus the traditional ISR chemical sensing approach. First, it does not require the indicator to be covalently bound to the receptor. Secondly, since there is no covalent bond, various indicators can be used with the same receptor. Lastly, the media in which the assay may be used is diverse. Chemical sensing techniques such as C-IDA have biological implications. For example, protamine is a coagulant that is routinely administered after cardiopulmonary surgery that counter acts the anti-coagulant activity of herapin. In order to quantify the protamine in plasma samples, a colorimetric displacement assay is used. Azure A dye is blue when it is unbound, but when it is bound to herapin, it shows a purple color. The binding between Azure A and heparin is weak and reversible. This allows protamine to displace Azure A. Once the dye is liberated it displays a purple color. The degree to which the dye is displaced is proportional to the amount of protamine in the plasma. F-IDA has been used by Kwalczykowski and co-workers to monitor the activities of helicase in E.coli. In this study they used thiazole orange as the indicator. The helicase unwinds the dsDNA to make ssDNA. The fluorescence intensity of thiazole orange has a greater affinity for dsDNA than ssDNA and its fluorescence intensity increases when it is bound to dsDNA than when it is unbound. A crystalline solid has been traditionally viewed as a static entity where the movements of its atomic components are limited to its vibrational equilibrium. As seen by the transformation of graphite to diamond, solid to solid transformation can occur under physical or chemical pressure. It has been recently proposed that the transformation from one crystal arrangement to another occurs in a cooperative manner. Most of these studies have been focused in studying an organic or metal-organic framework. In addition to studies of macromolecular crystalline transformation, there are also studies of single-crystal molecules that can change their conformation in the presence of organic solvents. An organometallic complex has been shown to morph into various orientations depending on whether it is exposed to solvent vapors or not. Host guest systems have been utilized to remove hazardous materials from the environment. They can be made in different sizes and different shapes to trap a variety of chemical guests. One application is the ability of p-tert-butycalixarene to trap a cesium ion. Cesium-137 is radioactive and there is a need to remove it from nuclear waste in an efficient manner. Host–guest chemistry has also been used to remove carcinogenic aromatic amines, and their N-nitroso derivatives from water. These waste materials are used in many industrial processes and found in a variety of products such as: pesticides, drugs, and cosmetics. ^ Steed, Jonathan W.; Atwood, Jerry L. (2009). Supramolecular Chemistry (2nd. ed.). Wiley. p. 1002. ISBN 978-0-470-51234-0. ^ Lodish, H.; Berk, A.; Kaiser, C. (2008). Molecular Cell Biology. ISBN 978-0-7167-7601-7. ^ Freeman, Wade A. (1984). "Structures of the p-xylylenediammonium chloride and calcium hydrogensulfate adducts of the cavitand 'cucurbituril', C36H36N24O12". Acta Crystallographica B. 40: 382–387. doi:10.1107/S0108768184002354. ^ Valdés, Carlos; Toledo, Leticia M.; Spitz, Urs; Rebek, Julius (1996). "Structure and Selectivity of a Small Dimeric Encapsulating Assembly". Chem. Eur. J. 2: 989–991. doi:10.1002/chem.19960020814. ^ a b c d e Anslyn, Eric V.; Dougherty, Dennis A. (2005). Modern Physical Organic Chemistry. MacMillan. ISBN 978-1-891389-31-3. ^ Piñeiro, Á.; Banquy, X.; Pérez-Casas, S.; Tovar, É.; García, A.; Villa, A.; Amigo, A.; Mark, A. E.; Costas, M. (2007). "On the Characterization of Host–Guest Complexes: Surface Tension, Calorimetry, and Molecular Dynamics of Cyclodextrins with a Non-ionic Surfactant". Journal of Physical Chemistry B. 111 (17): 4383–92. doi:10.1021/jp0688815. PMID 17428087. ^ a b Hu, J; Cheng, Y; Wu, Q; Zhao, L; Xu, T (2009). "Host–Guest Chemistry of Dendrimer-Drug Complexes. 2. Effects of Molecular Properties of Guests and Surface Functionalities of Dendrimers". Journal of Physical Chemistry B. 113 (31): 10650–10659. doi:10.1021/jp9047055. ^ Santo, M; Fox, M (1999). "Hydrogen bonding interactions between Starburst dendrimers and several molecules of biological interest". Journal of Physical Organic Chemistry. 12 (4): 293–307. doi:10.1002/(SICI)1099-1395(199904)12:4<293::AID-POC88>3.0.CO;2-Q. ^ a b Sun, S; Zhang, R; Andersson, S; Pan, J; Zou, D; Åkermark, Björn; Sun, Licheng (2007). "Host–Guest Chemistry and Light Driven Molecular Lock of Ru(bpy)3-Viologen with Cucurbit[7-8]urils". Journal of Physical Chemistry B. 111 (47): 13357–13363. doi:10.1021/jp074582j. ^ Zhu; et al. (1989). "Spectroscopy, NMR and DFT studies on molecular recognition of crown ether bridged chiral heterotrinuclear salen Zn(II) complex". Spectrochimica Acta Part A: Molecular and Biomolecular Spectroscopy. 62 (4–5): 886–895. Bibcode:2005AcSpA..62..886G. doi:10.1016/j.saa.2005.03.021. ^ Brandts; et al. (1989). "Rapid measurements of Binding Constants and Heats of binding Using a New Titration Calorimeter". Analytical Biochemistry. 179: 131–137. doi:10.1016/0003-2697(89)90213-3. ^ Sikora, C; Turner, R (2005). "Investigation of Ligand Binding to the Multidrug Resistance Protein EmrE by Isothermal Titration Calorimetry". Biophysical Journal. 88 (1): 475–482. Bibcode:2005BpJ....88..475S. doi:10.1529/biophysj.104.049247. PMC 1305024. PMID 15501941. ^ Witlicki, Edward H.; et al. (2009). "Determination of Binding Strengths of a Host–Guest Complex Using Resonance Raman Scattering". Journal of Physical Chemistry A. 113 (34): 9450–9457. Bibcode:2009JPCA..113.9450W. doi:10.1021/jp905202x. ^ Witlicki, Edward H.; et al. (2010). "Turning on Resonant SERRS Using the Chromophore-Plasmon Coupling Created by Host–Guest Complexation at a Plasmonic Nanoarray". Journal of the American Chemical Society. 132 (17): 6099–6107. doi:10.1021/ja910155b. ^ Koshland, D (1996). "The structural basis of negative cooperativity: receptors and enzymes". Current Opinion in Structural Biology. 6 (6): 757–761. doi:10.1016/S0959-440X(96)80004-2. PMID 8994875. ^ Jencks, W. P. (1981). "On the attribution and additivity of binding energies". Proceedings of the National Academy of Sciences, USA. 78 (7): 4046–4050. Bibcode:1981PNAS...78.4046J. doi:10.1073/pnas.78.7.4046. PMC 319722. PMID 16593049. ^ Dobrzanska, L; Lloyd, G; Esterhuysen, C; Barbour, L (2003). "Studies into the Thermodynamic Origin of Negative Cooperativity in Ion-Pairing Molecular Recognition". Journal of the American Chemical Society. 125 (36): 10963–10970. doi:10.1021/ja030265o. ^ Hughes, A.; Anslyn, E (2007). "A cationic host displaying positive cooperativity in water". Proceedings of the National Academy of Sciences, USA. 104 (16): 6538–6543. Bibcode:2007PNAS..104.6538H. doi:10.1073/pnas.0609144104. PMC 1871821. PMID 17420472. ^ Brown, Philip; Semeniuk, Konstantin; Wang, Diandian; Monserrat, Bartomeu; Pickard, Chris J.; Grosche, F. Malte (2018-04-01). "Strong coupling superconductivity in a quasiperiodic host–guest structure". Science Advances. 4 (4): eaao4793. doi:10.1126/sciadv.aao4793. ISSN 2375-2548. ^ a b Cheng, Y.; Wang, J.; Rao, T.; He, X.; Xu, T. (2008). "Pharmaceutical applications of dendrimers: promising nanocarriers for drug discovery". Frontiers in Bioscience. 13 (13): 1447–1471. doi:10.2741/2774. ^ Cheng, Y.; Xu, T. (2005). "Dendrimers as Potential Drug Carriers. Part I. Solubilization of Non-Steroidal Anti-Inflammatory Drugs in the Presence of Polyamidoamine Dendrimers". European Journal of Medicinal Chemistry. 40 (11): 1188–1192. doi:10.1016/j.ejmech.2005.06.010. ^ Cheng, Y.; Xu, T; Fu, R (2005). "Polyamidoamine dendrimers used as solubility enhancers of ketoprofen". European Journal of Medicinal Chemistry. 40 (12): 1390–1393. doi:10.1016/j.ejmech.2005.08.002. ^ a b Cheng, Y.; Xu, Z; Ma, M.; Xu, T. (2007). "Dendrimers as drug carriers: Applications in different routes of drug administration". Journal of Pharmaceutical Sciences. 97: 123–143. doi:10.1002/jps.21079. ^ D’Emanuele, A; Attwood, D (2005). "Dendrimer–drug interactions". Advanced Drug Delivery Reviews. 57 (15): 2147–2162. doi:10.1016/j.addr.2005.09.012. ^ Malik, N.; Evagorou, E.; Duncan, R. (1999). "Dendrimer-platinate: a novel approach to cancer chemotherapy". Anti-Cancer Drugs. 10 (8): 767–776. doi:10.1097/00001813-199909000-00010. PMID 10573209. ^ de Silva, A.P. ; McCaughan, B; McKinney, B.O. F.; Querol, M. (2003). "Newer optical-based molecular devices from older coordination chemistry". Dalton Transactions. 10 (10): 1902–1913. doi:10.1039/b212447p. ^ Anslyn, E. (2007). "Supramolecular Analytical Chemistry". Journal of Organic Chemistry. 72 (3): 687–699. doi:10.1021/jo0617971. PMID 17253783. ^ Nguyen, B.; Anslyn, E. (2006). "Indicator-displacement assays". Coor. Chem. Rev. 250 (23–24): 3118–3127. doi:10.1016/j.ccr.2006.04.009. ^ Yang, V.; Fu, Y.; Teng, C.; Ma, S.; Shanberge, J. (1994). "A method for the quantitation of protamine in plasma" (PDF). Thrombosis Research. 74 (4): 427–434. doi:10.1016/0049-3848(94)90158-9. PMID 7521974. ^ Eggleston, A.; Rahim, N.; Kowalczykowski, S; Ma, S.; Shanberge, J. (1996). "A method for the quantitation of protamine in plasma". Nucleic Acids Research. 24 (7): 1179–1186. doi:10.1093/nar/24.7.1179. PMC 145774. ^ Atwood, J; Barbour, L; Jerga, A; Schottel, L (2002). "Guest Transport in a nonporous Organic Solid via Dynamic van der Waals Cooperativity". Science. 298 (5595): 1000–1002. Bibcode:2002Sci...298.1000A. doi:10.1126/science.1077591. PMID 12411698. ^ Kitagawa, S; Uemura, K (2005). "Dynamic porous properties of coordination polymers inspired by hydrogen bonds". Chemical Society Reviews. 34 (2): 109–119. doi:10.1039/b313997m. ^ Sozzani, P; Bracco, S; Commoti, A; Ferretti, R; Simonutti, R (2005). "Methane and Carbon Dioxide Storage in a Porous van der Waals Crystal". Angewandte Chemie. 44 (12): 1816–1820. doi:10.1002/anie.200461704. PMID 15662674. ^ Uemura, K; Kitagawa, S; Fukui, K; Saito, K (2004). "A Contrivance for a Dynamic Porous Framework: Cooperative Guest Adsorption Based on Square Grids Connected by Amide−Amide Hydrogen Bonds". J. Am. Chem. Soc. 126 (12): 3817–3828. doi:10.1021/ja039914m. PMID 15038736. ^ Dobrzanska, L; Lloyd, G; Esterhuysen, C; Barbour, L (2006). "Guest-Induced Conformational Switching in a Single Crystal". Angewandte Chemie. 45 (35): 5856–5859. doi:10.1002/anie.200602057. PMID 16871642. ^ Eric Hughes; Jason Jordan; Terry Gullion (2001). "Structural Characterization of the [Cs(p-tert-butylcalixarene -H) (MeCN)] Guest–Host System by 13C-133Cs REDOR NMR". Journal of Physical Chemistry B. 105 (25): 5887–5891. doi:10.1021/jp004559x. ^ Serkan Erdemir; Mufit Bahadir; Mustafa Yilmaz (2009). "Extraction of Carcinogenic Aromatic Amines from Aqueous Solution Using Calix[n]arene Derivatives as Carriers". Journal of Hazardous Materials. 168 (2–3): 1170–1176. doi:10.1016/j.jhazmat.2009.02.150. PMID 19345489.